Yes - the new season is under way and happy fishermen and women have been in the shop. The Red Hot Killer Nymphs are the number one choice for most, followed by NZ Tungsten Gold Bead Mayfly Nymphs in smaller sizes. The wee bit of bling on these seems to work early season on the Southland rivers. Lots of different guides have been in for their season stock up and it's always good to catch up with them and find out how their bookings are. This is a time when most of the guides actually get a few days to fish, well the keen guides do. For me that's a great thing to see guides who like me have fused their passion with their work still out there enjoying there passion. was through yesterday and had managed a 3/4 day out playing. He had managed to land 5 brown trout between 3-5lb and was pretty happy about that on his first day of the season. He was pretty disappointed that I was out of my black Ninja Nymphs as he was after dozens of them as they were his go to fly of the day and last season. Which was great to hear that his clients had success with them, he was mainly fishing them of the back of a size 10 Mayfly Bomb connected by 5lb rio fluro plus tippet. Hopefully I'll have the Ninjas back in stock soon. 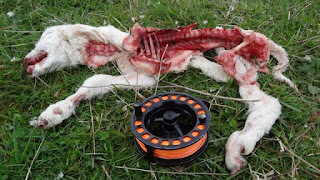 It's spring and sometimes the young lambs don't make it to the barbie. This one was eaten by some feral pests. The weather here in Athol has actually been pretty settled and the main Mataura river has been mainly running clear. Snow has fallen on the mountains and some days it's cold. But already the birds are looking for nesting materials and spring is on its way. Non Spooky Trout And Spooky! 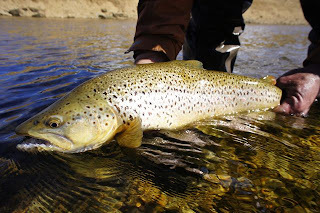 Most of the trout at the start of the season will let you have a few casts over them, some trout that I was guiding some clients onto who were not so accurate let us try up to 20 times before they were hooked or not. Though it was interesting to see some trout after 3 attempts learn pretty quickly. Already I hear some of the larger wise trout on some rivers that have not been caught are moving off just after one fly drift past them - I love that stuff it just amazes me, that some how they know the season has opened, and seem to remember from previous seasons. The days have been long in the office, busy working on some new cool stuff that soon you will get to know about. I'm twitching to get on the vice but the paper work comes first - well so my accountant keeps telling me. Great customer feedback - photos and comments. Some of the biggest Bonefish have been caught on my designs! Have a great season and will see you when I'm down poaching your Area!!!!!!!!!!! 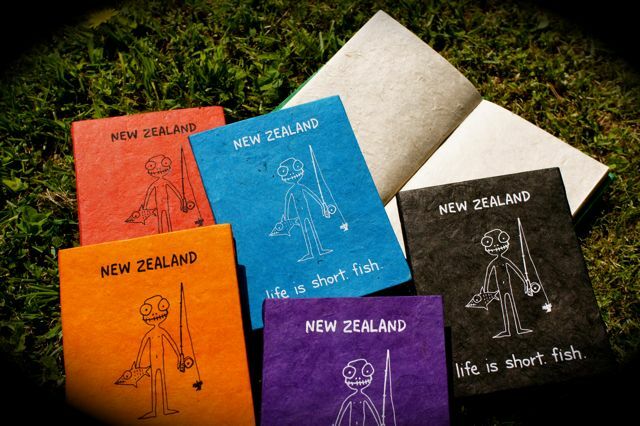 Just in is a new DVD The Waters Of Greenstone and it's pretty cool that Stu's Fly Shop is on it. Check out one of the trailers. Well the much publicized Oreti river has been getting it's usual pounding at the start of the season and there is nothing wrong with that - it's a great river. I was told the other day already people thinking it's their river and letting down the tyre of a vehicle that was parked on the top bridge - I'm not sure if this person was camped there all night, that's beside the point.. 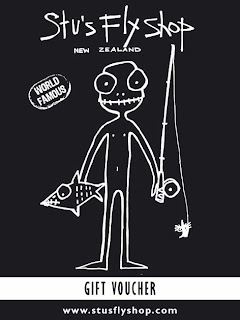 Things like this are not good for NZ, so if you saw anything please report the culprit to the police, fingers have been pointed but no evidence, there was a few people around that day at the top bridge, someone knows something - we are fishermen not vandals - come on guys! Lucky the guy had a spare. Remember to sign up for the newsletter and like us - on facebook - doing so, you will be receiving some great new special offers, shop news and our new competition news! Ela (the fake blondie) is in charge of that side of things, so send her your feedback and photos. We love all the cool photos and soon will be using them, so watch out for your mug shot appearing ! Huge deals on fly tying material! 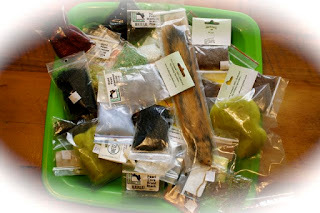 Yes I'm over stocked with fly tying material so - it's at the moment all 1/2 price what is in stock, dubbing, foam etc. I have also got to move some models of Sage rods and Lamson reels so check out the clearance section on the site for some great deals. Simms boots and waders are also getting cleared out and are heavily discounted all the ones in stock - I have limited stock so contact me soon - or check the clearance section on the site. If you have the book the trout diaries - read it again and get your juices flowing. The author will be through to sign books in the shop, so if you do not have a copy of this book - if you get one from me it will be signed - and may be worth $$$$$ in the future ? Eddie with one of his big browns before he fell in! The last time I guided Eddie he fell over in the middle of the river and went right under. What was strange he just fell over it was a flat sand bottom. Being professional I did not laugh as I could see his man pride was hurt ! :) He made me promise not to tell anyone - especially his father back at the shop. Being myself - I have never told anyone! After some years he returned to be guided again and lucky for us we picked the right day and he caught and lost some lovely big browns. Here is a few photos of the days guiding the other day we got most of the fish on size 12 NZ grey Realistic Mayfly Nymphs off a size 8 bomb as the water was deep and we need a heavy bomb to get the smaller nymph down. are stockiest of my flies and their orders are getting bigger and bigger. Which is awesome as they have supported me right from the start as they know quality. If you are in their area check out their shop and services. 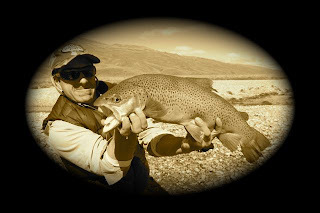 So if you know or are a cool fly shop that wants to stock my Superior fly range contact me or Ela. Well best get to the shop and get my open flags out!